The Facebook Video Downloader can be used to download online videos from Facebook so that the same can be shared with friends and family members. Even if the user is not connected to internet, this software enables viewing of Facebook videos anytime and anywhere. Facebook being the most popular social networking website in the world, there can be quite a few videos that may need to be downloaded so that many people can enjoy the same. This can be achieved by converting them into portables with the help of the free Facebook Video Downloader. The videos that are downloaded can be saved in a number of formats as per the requirements of the user. 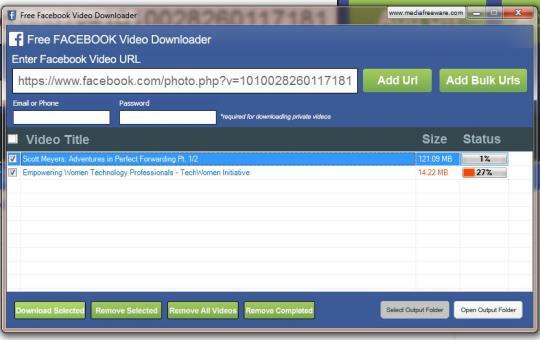 Even other video sharing websites such as YouTube, Vimeo, etc, are also compatible with the Facebook Video Downloader. There are a number of devices that can these videos can be downloaded onto. The software can even be used to download HD videos from Facebook. Once the software is downloaded by the user, it is very easy to use it. The first step is to copy the Facebook video URL that needs to be downloaded. The user can also add multiple URLs so that several videos can be downloaded at the same time. The 'Open Output Folder' is the next step that needs to be carried out. Once this is done, the 'Download Selected' button needs to be clicked. The software also allows the user to remove select videos. Apart from this, all the videos that have been downloaded can also be removed with a single click. The quality of the videos that have been downloaded does not get affected with the Free Facebook Video Downloader. What makes it even better is that the user can view and download videos at the same time.